The most challenging part of sewing a garment is that you can't try it on until after it is sewn. And, if it doesn't fit right, you can't just go back to the store for another size. Finding the right fit before you start sewing can solve this problem. Since everyone's different, there are also adjustments you can make to a sewing pattern that will customize the fit perfectly to your body and ensure your handmade clothes look great. Every pattern should offer various sizes, the trick is to find the right one for you. Even if you've always purchased the same size of clothes from the store, your figure can change in just a few months. When sewing your own clothes, you'll want to regularly take your measurements. New Mexico State University offers great information to help you choose a sewing pattern that will meet your expectations. Not only will you learn how and what to measure, but it also offers advice on factors to consider when choosing a pattern for both kids and adults. Starting with the correct size pattern saves you alterations that you can avoid and ends with a well-fitted garment. That's why you might also want to consult this Threads Magazine to ensure you choose the correct size pattern for the garment you are going to sew. Another approach you can take is measuring the clothes you already own and know fit just the way you want them. By taking measurements of your store-bought clothes, you can ensure your sewing project will fit just the way you want it to. This is also a great trick when sewing garments for someone else as a surprise. You can simply borrow a favorite piece of clothing for a minute and get the measurements you need. When you talk to someone who has sewn for a long time or read an advanced sewing book, you are bound to hear or read "pattern grading." Don't let the term scare you. It simply means using a specific system of measurements to increase or decrease the pattern size. It's how clothing manufacturers can make the same garment in different sizes and is something you can do as well at home. The various sizes for sewing patterns are designed for the "average" person. While one size might fit your waist perfectly, you might have a fuller bust or wider shoulders than it allows for, so you will have to make some adjustments. It can be confusing at first, so you'll want to ensure that can help you understand how to make custom alterations properly. There are many approaches to altering a sewing pattern. One of the easiest to understand is making adjustments to the seam lines. Threads Magazine offers some fantastic tips for getting started with this technique. It's a good method for anyone who's new to sewing or when other methods have failed. Do you want to alter every pattern you touch or do you want to have a basic pattern to work from? 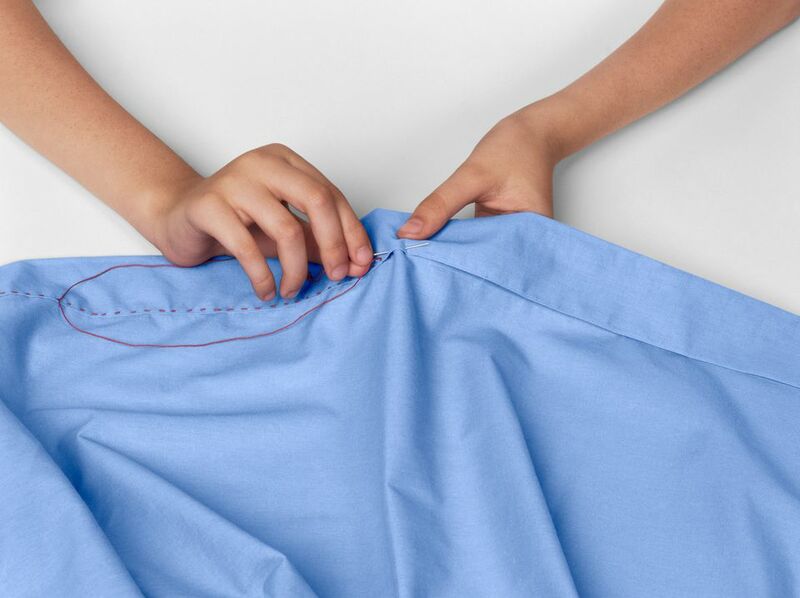 You might find it best to learn how to create and use a basic sloper. This is a basic fitting pattern that is designed just for one person's specific body measurements. It can take a lot of the guesswork from your custom alterations and save a significant amount of time when sewing. When sewing your own pants, getting the measurements right from the start can save a lot of hassle. It can be confusing, however, to know exactly where to measure your waist or your hips. If you're even one inch off, your pants may not sit right, especially when you sit down! Taking some extra time to double check the waist, hip, crotch, and length of your pants and applying the correct ease can ensure a perfectly flattering fit. Shoulders can be one of the hardest parts of a shirt, blouse, or dress to get right. It's also a place where the proper fit is essential to your comfort; shoulders that are too wide may drape in unflattering ways, too narrow and you won't be able to move. Learning how to customize the shoulders can significantly improve your finished garment's appearance. If the bodice of a garment doesn't fit, don't expect the armhole or shoulder to fit the way they should, either. These pieces of a top are interconnected, so learning how bodice alterations affect the armhole is an essential part of a perfect fit. With the correctly sized shoulders, you might still have problems with the fit of a shirt if the back is too roomy, which usually results in wrinkles near the armholes. Threads Magazine offers some easy-to-follow advice for adjusting a pattern piece for a narrow back to take care of this issue. Then again, you may need a little extra room in the back of your shirts. Threads Magazine offers a solution for this as well. It is a little more difficult to make alterations for what's called a "Dowager's hump," but the article will walk you through every consideration you need to make for proper fit on a rounded upper back, including the best types of fabrics to choose. Everyone wants jeans that fit, and this article will guide you to that goal. It may even help you have other slacks that have a proper fit. Properly sewn darts are essential to a well-finished garment, offering a little more give in places where it's needed most. Typically, darts are sewn into the bodice, the back, or the waistline and they help ensure a proper fit. Sewing them correctly is the first step to a dart laying properly when you wear your new sewing project. You don't have to be plus-size or sew a plus-size garment to learn valuable things from this wonderful article by Threads Magazine. It contains all kinds of information about choosing types of fabric for the most flattering fit and how to decide if a lining is needed.